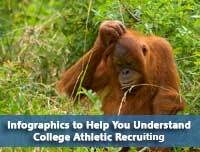 If you’re a high school athlete or the parents of an athlete who wants to play at the college level, the sooner you understand the college athletic recruiting process, the sooner you can use the process rather than have the process control you. And while the chances of being paid to be an athlete in your particular sport may be minuscule, it can’t hurt having a grasp of some of the issue of paying student-athletes. I think the following infographics on college athletes provide a good place to start your education. Athletic Scholarships: Who is Getting the Money? This is probably the best infographic for understanding a high school athlete’s chance of getting a college athletic scholarship. It shows that only 2% of high school athletes receive athletic scholarships and that there are 22 times more academic scholarships than athletic. The data for this infographic is mainly for D1 sports although it shows overall D2 and D3 athletic graduation rates for comparison. Depending on the sport and conference, athletes may graduate at substantially higher rates than the general student population. However, there are some conferences where athletes have much lower graduation rates than the average student. This infographic shows the percentage of athletes who receive scholarships by sports. The graphic shows the relative number of athletes in a sport while indicating which provides the most scholarships. You guessed it-rowing! Basically, this is what the title says. It shows the major college athletic recruiting violations by conference and school and notable coaches’ contributions. Unfortunately, it doesn’t say what happens to the athletes who were recruited under these violations. If they cut scholarships, that means someone is going to be paying more to go to college. This infographic lists eight myths about college sports. The focus is on revenue sports of football and basketball and the schools of the Football Bowl Subdivision. It contains information relevant to high school athletes including graduation rates and scholarship shortfalls. The data in this infographics are based on the 2007-2008 year. The interesting information is the percentage change in recruiting expenses from 1997 to 2007. The tables list the top five spenders by NCAA division. Perhaps the most interesting information on this graphic is the origins behind the term “student-athlete.” The expense breakdown of the most profitable football team, University of Texas Longhorns, also makes for interesting reading. 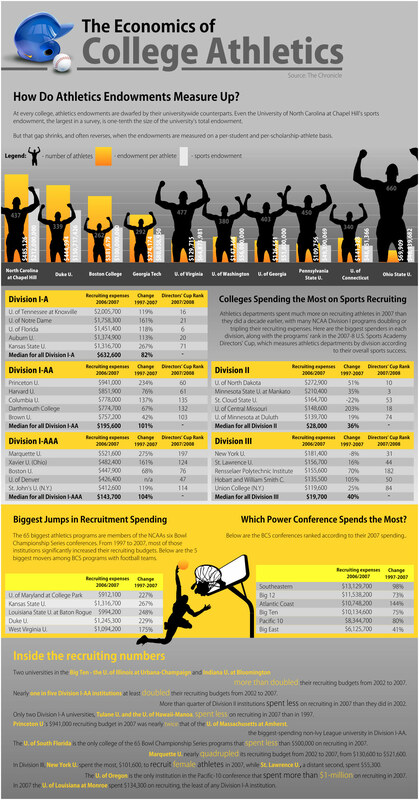 If you want an idea of how much money is involved in D1 sports, start looking here. The data are from 2010 so it still has Mack Brown as the highest paid head football coach. To understand why football has 85 head count scholarships, skip to the bottom of the infographic.